Additional information can be found on New York State's Paid Family Leave website. We encourage you to contact your HR representative with questions. In 2016, Governor Cuomo signed into law the New York State Paid Family Leave (NYPFL) policy that requires employers to offer paid leave for eligible non-academic staff members to bond with a new child, care for a family member with a serious health condition, or for a qualifying military exigency. New York State's timeline called for a phased rollout over four years, with the benefit level starting at 8 weeks, 50 percent pay in 2018, and reaching 12 weeks, 67 percent pay in 2021. Cornell launched the program in January 2018 at the year-four level. New York State required benefit for 2019: 10 weeks of leave at 55 percent of pay, up to the annual NYS wage cap. Cornell University benefit: 12 weeks of leave at 67 percent of an employee’s average weekly wage. Non-academic staff who work 20 or more hours per week are eligible to request the leave after 26 weeks of employment. Non-academic staff who work less than 20 hours per week are eligible to request the leave after 175 days worked (not consecutive days employed). New York State specified that the Paid Family Leave Program is employee-funded, and that employers shall collect an employee contribution through a payroll deduction determined annually by the New York State Department of Financial Services. In 2019, the rate will be 0.153% of an employee’s average weekly wage, capped at an annual deduction of $107.97. Cornell will automatically cease taking further NYPFL deductions once an employee has contributed $107.97 during calendar year 2019. Rates are be set by NYS on an annual basis and will be updated again for 2020. All items on this form must be completed and submitted at least 30 days in advance of the requested leave. If less than 30 days advance notice is being given, an explanation must be provided. Additional forms and supporting documentation will be required depending on the type of leave being requested. These forms will be provided once the PFL Request Form has been received. The total time afforded to both parents for leave remains the same, but the paid period increases from 4 weeks to 12 - and is provided at a higher rate - and in turn, the unpaid time decreases from 12 weeks to 4. 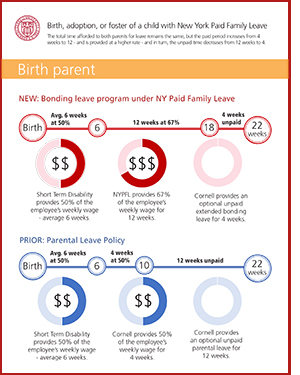 Check out our comparison graphic to see how the new bonding leave program under NYPFL matches up to the prior parental leave policy. See University Policy 6.2.1, Leaves for Professors and Academic Staff.